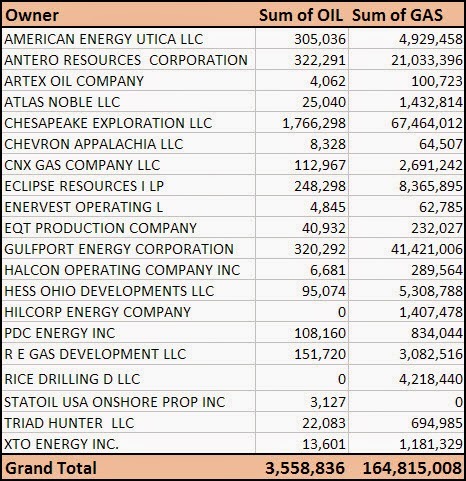 The new release of Ohio Utica Shale Production data shows the following production numbers by owner/operators and counties. Chesapeake alone is producing nearly 50% of all oil from the Utica Shale, accounting for 49.6% of the total production in the quarter, and 40.9% of all gas production. Gulfport Energy comes in 2nd in gas production. Antero Resources comes 2nd in oil production, followed by Gulfport Energy. Antero Resources is 3rd in gas production, followed by Eclipse Resources. Carroll leads all counties in both oil and gas production. 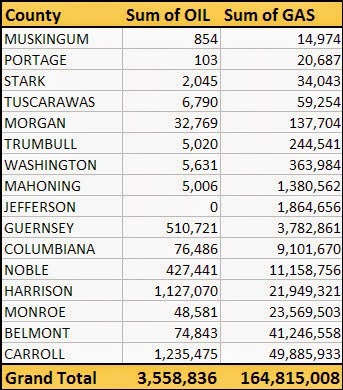 Carroll county is trailed closely by Harrison County in oil production and Belmont County in gas production. Carroll and Harrison Counties combine for 2/3 or 66.4% of all oil production in the quarter.